A True Doors transformation in New Brunswick, Canada. 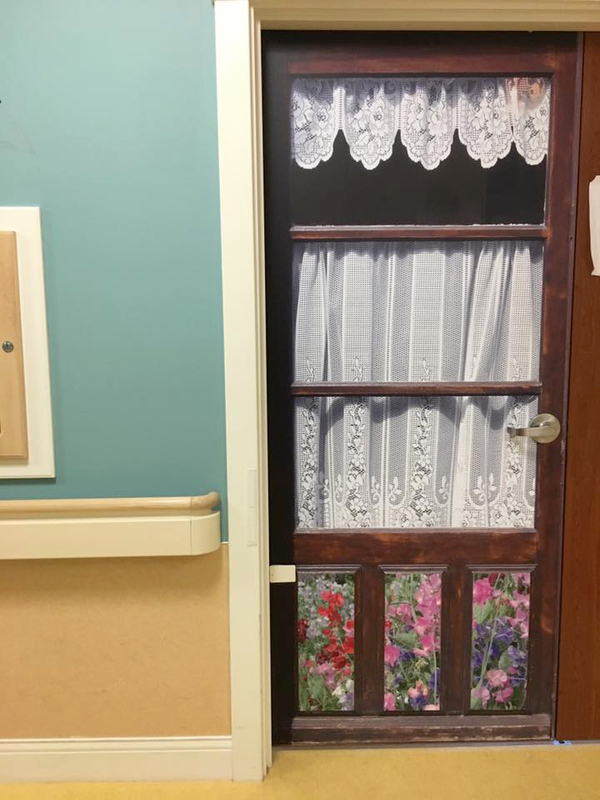 True Doors decals improve quality of life for seniors and people with special needs living in care facilities. 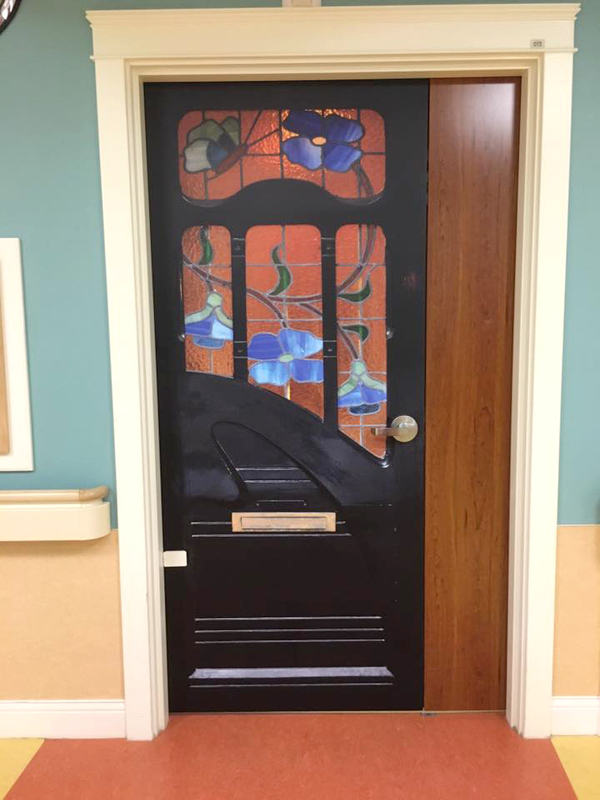 Students help to use True Doors as a tool for person-centered care at Nashwaak Villa. 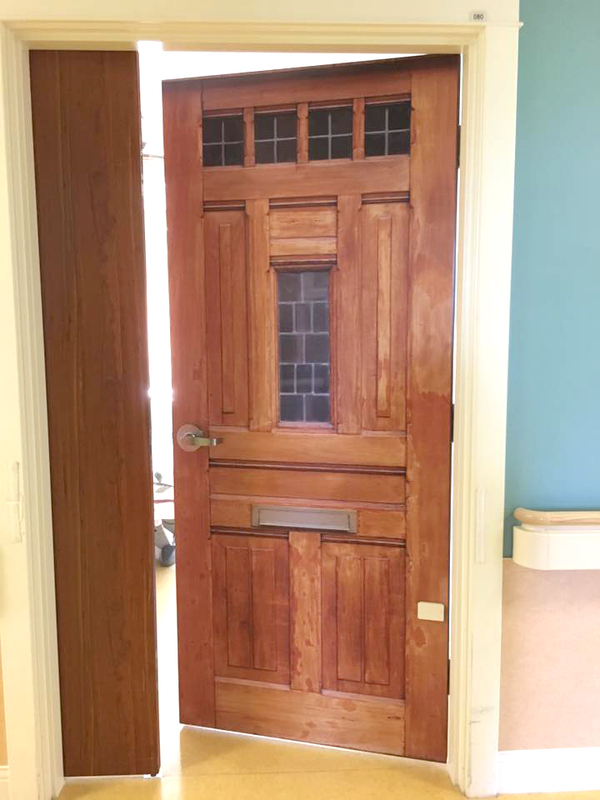 Nashwaak Villa in New Brunswick, Canada, recently completed a True Doors transformation, where residents’ chose their True Doors with help from family, staff and local students. Person-centered care was at the heart of their approach every step of the process, and as such it’s been a lovely project to support and the results are heartwarming. 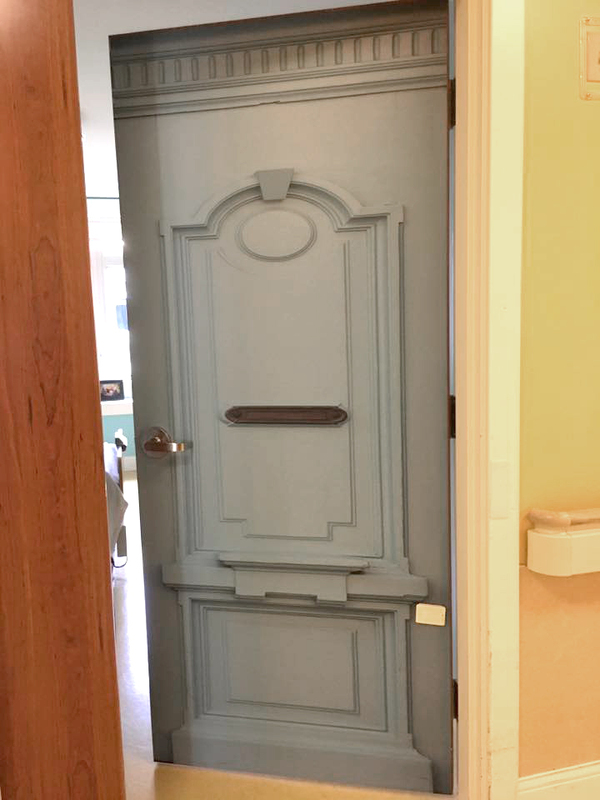 Daphne Noonan, Executive Director at Nashwaak Villa, understood straight away that the process of finding the “right” doors has value in and of itself, as everyone involved has the opportunity to better learn about residents histories and preferences. It’s the first time with any project in twelve countries that students have been involved in helping to find the True Doors with residents. Nashwaak Villa runs an intergenerational program where students from the local school take part in activities, spending time with the residents throughout the year. Just before the summer break, residents’ families received an introductory leaflet, explaining what Nashwaak sought to gain from the project and how they could help. Pam Spilman, from the Nashwaak nursing team, then took a day to call the families, leaving messages, ensuring that everyone was aware of the project. During the five-week summer camp older students began going through the shortlist of options families had put other, using an iPad to also browse the main True Doors collection. 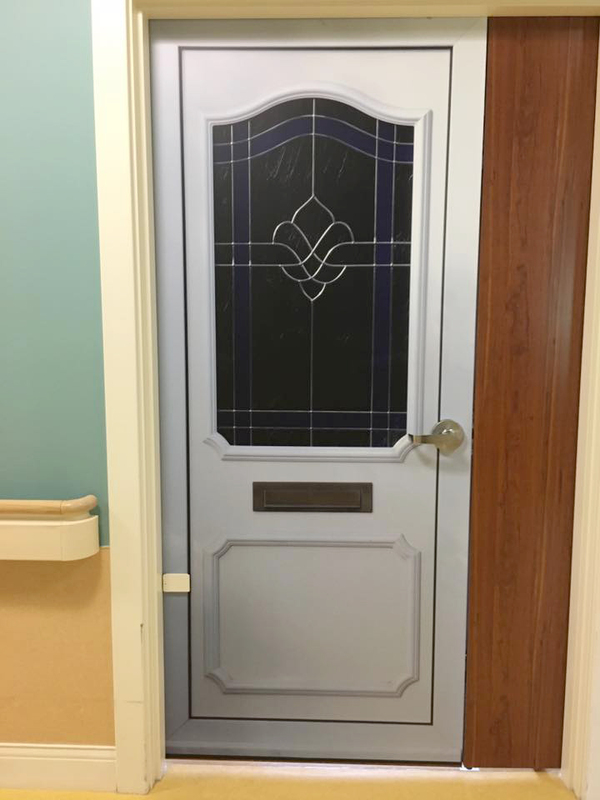 The final choices ranged from doors from the local area, doors from previous homes, personalised doors and lots from the main True Door collection. And each choice made by a resident has its own story. A new group of students, who’ve joined Nashwaak’s autumn program, are now collating and writing up the stories behind the doors, which we are very much looking forward to reading. Access the complimentary True Doors success guide. There’s been a steady flow of feedback since the True Doors went up. The results have been energising for all involved. Here Melody O’Neill, Director of Care, shares her experience of the effect of the project. It's just a whole different atmosphere. People seem to be more chatty and everyone loves the doors. And it's opened up conversations that we have never even thought of before... It's just a wonderful thing... They're breathtaking. We the residents of Nashwaak Villa are truly delighted with the new doors. Many friends and relatives have come to see the doors. They are beautiful. Beautiful! It feels like part of Holland has come to us. Members of the Nashwaak team and family have noticed myriad effects since the True Doors have been up. I have noticed a lot of residents were very pleased and enthusiastic to see all the different door choices. A lot of residents enjoy having the opportunity to show off the doors they or their family has chosen. They make the halls have more of a home feel. Residents and family members have great social interactions talking about each other's doors. They give our home a more personal and homely feel. It doesn't feel like our residents are in a healthcare facility. I love all the new doors! Residents enjoy the new doors. It’s always a conversation starter and can act as a distraction when needed. Many residents find it easier to find rooms and family seem to enjoy them. Makes our hallways warm and welcoming. Good conversation piece. Many people come in to see the doors. They give more social interaction for our residents. Definitely, improve quality of life. I find them very warming to the building - more homely feeling. The residents like to look at each others' doors and also share them with family and friends. As they remind them of their past they can relate to them personally. Some do also remind me of my childhood. I really enjoy seeing them every day. A resident told me a story about how her door reminded her of the times her husband went fishing in the past on the Nashwaak River. She used to look out of the car window while her husband was fishing and this is the image she imagines when she looks at the door. I have noticed a huge positive effect with the True Doors. Brightens the hallways and gives a more home-like feeling. Very pleased with the result. - Daughter of a resident at Nashwaak Villa in New Brunswick, Canada Selected: Wave | Chosen because: Similar to home door. We had fun interactions while deciding on the right door. Residents find their rooms more easily and memories are awakened. Makes the hallways seem bigger with the (true) doors. I love this. I have no complaints at all. - Bernard Gullison | Husband of a resident at Nashwaak Villa in New Brunswick, Canada Selected: Personalised True Door | Chosen because: Reminds Bernard's wife of the times she went fishing with him. I notice that there's now a more homely feeling and more social interaction at Nashwaak Villa. - Richard Lyons | Husband of a resident at Nashwaak Villa in New Brunswick, Canada Selected: Blocks | Chosen because: Looks like the kitchen door. The doors look great. Love the idea. Feels more like home. - Darren Munn | Son of a resident at Nashwaak Villa in New Brunswick, Canada Selected: Medusa | Chosen because: Looks like the door at the first house. I have never seen these doors before, but they are beautiful. They look so real! - Nancy McNeill | Daughter of a resident at Nashwaak Villa in New Brunswick, Canada Selected: Flower Power | Chosen because: Mum loves flowers. Definitely makes the room feel more “hers” and gives her a reminder of all the people she has created. - Patricia Bishop | Daughter of a resident at Nashwaak Villa in New Brunswick, Canada Selected: Marine | Chosen because: Looks like old style door from childhood. The doors are so nice! Each one is so individual to the residents' lives and experiences. Each time we walk past them we talk about them. Certainly does bring a homely feeling. - Terera Brown | Step-daughter of a resident at Nashwaak Villa in New Brunswick, Canada Selected: Wide One | Chosen because: Similar to the one growing up. Mom put a lot of thought into each picture on the door. It truly tells her life story. She is so proud to show it to everyone that stops by. - Anna Rice | Daughter of a resident at Nashwaak Villa in New Brunswick, Canada Selected: Personalised True Door | Chosen because: Pictures that remind Anna's mom of her life story. The doors look fabulous and make it look more homely. Love them and this was a great idea. We are very proud to be involved with such an amazing creation, that brings a lot of stories, that have been told to us, by our friends who live here, to life. Some love to talk about where they once lived. One lady told me, she now feels as though she brought part of her old home with her, to her new home. She explained it to be of great comfort to her and it made her feel peaceful. A lot of our friend here love the fact that they can easily find their own rooms. Not having every door the exact same was a blessing to them. No more getting lost as they now recognized their own door. This project has sparked a lot of chatter. Most people coming into our place want to know what made each person here decide on such a door, so it’s a real joy to see our community interacting with all our friends that make Nashwaak Villa their home. 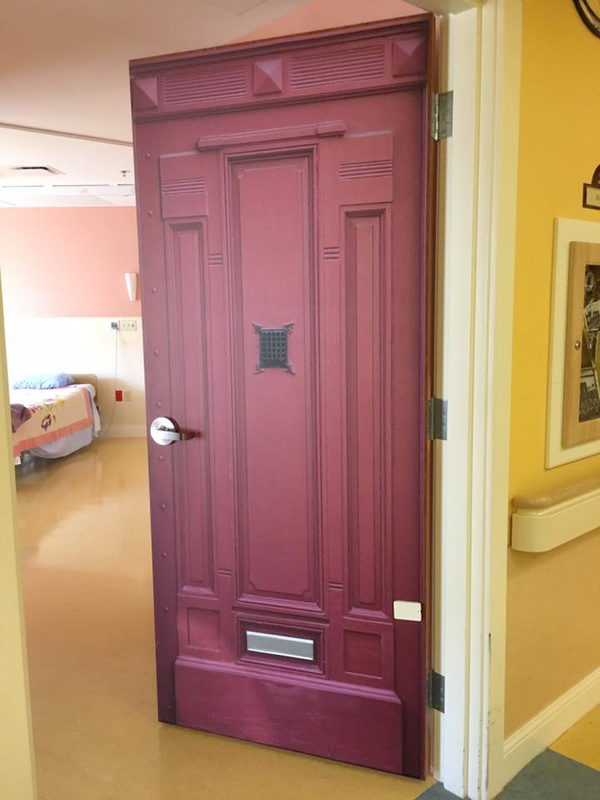 Families are totally immersed in this project and are so proud to have their loved one, make the decision as to what door they wanted. So often so much is taken away, and we just really wanted to give something back. Some of our friends here say they feel more secure as if the were home.